Finally! A sequel to the awesome physics game that has taken the world by storm is finally here. 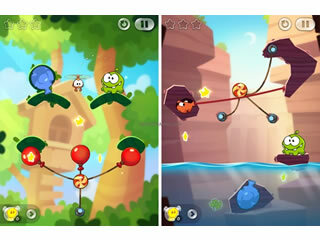 Cut the Rope 2 is even better than the original. These cute little monsters are back in their candy-eating adventure. The basic goal of the game is that you need to feed candy to a monster. You can go above and beyond and collect stars as you move along. The first couple of levels are really easy just to let you get a feel for how the game works. There are various ropes, weights, swings, stars, and balloons that work together to form complex little physics puzzles. The game is called ‘Cut the Rope’ because usually you have to cut a rope that’s holding a certain weight. You cut it by clicking and dragging across the rope. Easy right? Nope! It’s a fun challenge, because you need to figure out when and where to make the cut. Sometimes the candy will be swinging and you have to time the cut right to use the centrifugal force to make it fly to the monster. Sometimes, it’s the monster that’s being held up by ropes, which is even cuter. Other things you might need to do include popping balloons or blowing air through whoopee cushion-like thingies (but don’t worry, they don’t make gross noises). If you like physics and problem solving, then you’ll absolutely fall in love with Cut the Rope 2. It’s a cute and family-friendly game that is good for all ages. It is the kind of brain workout that will keep you sharp in other aspects of life. My father always said that playing video games will turn your brain into oatmeal, but my father has never played either of the Cut the Rope games. Gravity, centrifugal force, rope and wind blowing thingies really come together well in this exciting and tricky game. You’ll find yourself addicted for hours! 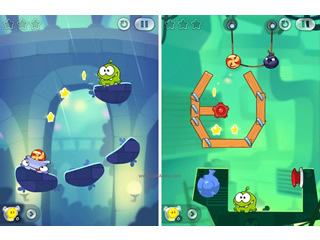 This is Cut the Rope 2 review. Download this game here.